Knock knock. Who’s there? Everyone knows how this goes. It’s one of the first kinds of jokes children learn, and it seems like it must be one of the oldest kinds of jokes in the world. Actually, no one knows for sure when and where the knock-knock joke was invented, but it seems to have been more recent than I expected. Many people credit the porter’s monologue in Act II Scene 3 of Macbeth, but in my opinion it isn’t enough to say “Knock, knock, Who’s there?” even in a satirical way. 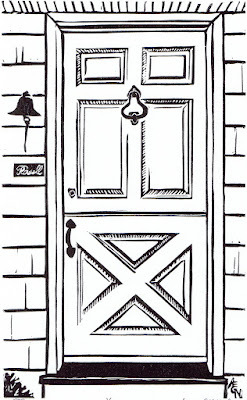 After all, knocking is always what happens on doors and “Who’s there” is an obvious reply. That’s not a knock-knock joke. Moreover, no one has found any example of a true knock-knock joke until the 1930s. If Shakespeare invented them, why three hundred years before his audiences responded to them? In 1922 a newspaper columnist noted a popular type of joke in which someone would ask “Have you heard of [name]“ and when the response was “[Name] who?” you’d get a punchline just like those in knock-knock jokes. 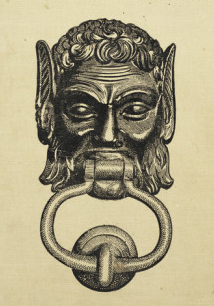 It wasn’t until the 1930’s that the now-familiar knock-knock format appeared (so where was Shakespeare in 1922? ), and by 1936 they had gone viral, appearing in newspapers, incorporated into popular novelty songs, and railed at by critics who deemed them lowbrow and unfunny. Humor is, of course, a matter of opinion, but what’s actually going on with the language when we make puns? Paranomasia, which is to say punning, depends on the fact that homonyms may cause lexical ambiguity, which is to say that similar-sounding words with different meanings can cause a sentence to be interpreted in more than one way. And although many people have sneered at puns as “the lowest form of humor” (Samuel Johnson) and despite their irritating popularity among five-year-olds, devising and decoding puns actually takes some really sophisticated brainpower. (Notice when young children try to tell knock-knock jokes before they actually have the brainpower to handle puns. Their attempts can often be funny, but only because of absurdity and adorableness, not paranomasia.) You have to interpret a single set of sounds in two markedly different ways, and hold both interpretations in your mind simultaneously, contrasting them. That’s what makes the joke funny: the difference between the expected meaning and the unexpected. Probably it’s precisely because puns require a high level of attention and verbal brain-work that knock-knock jokes use their invariable formula to warn you to get ready for some ludic language interpretation. Furthermore, many puns require knowledge of history or current events, cultural references, or complicated or specialized vocabulary. Knock-knock jokes in general, like much humor, can also serve sophisticated social functions, such as defusing tension, making something memorable, or marking solidarity. Dwayne who? Dwayne the bathtub! I’m dwowning! Delores who? Delores my shepherd. Anne who? Another bad knock-knock joke. After all, who can’t make up a sentence that begins with the sound an? But Hiawatha who? You really wonder how that one’s going to turn into something else. Boo who? I didn’t mean to make you cry. Little old lady who? I didn’t know you could yodel. I confess I find these less amusing, because they’re more predictable. As soon as “Boo who” has escaped your mouth you already know where this is going. Indeed you can usually see it coming as soon as the jokester says her bit. But much of the same brainwork is still going into them. Banana who? Knock knock. Who’s there? Banana. Banana who? 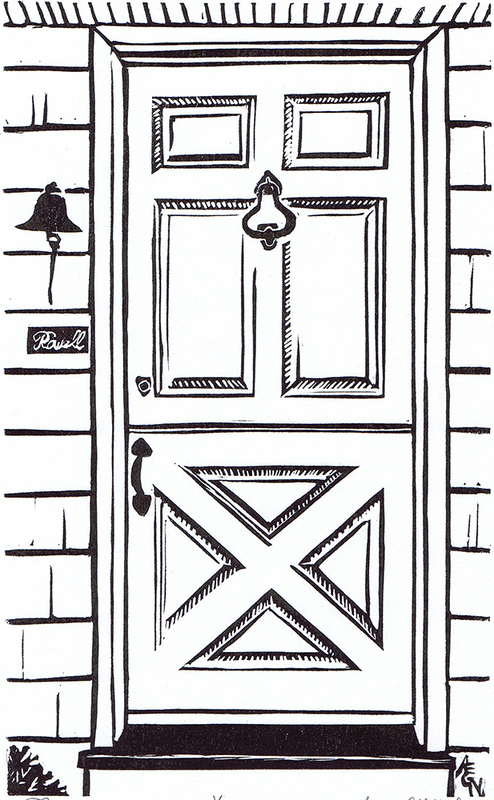 Knock knock… repeated until the jokester judged that the audience was on the verge of revolt. Then: orange. Knock-knock. Who’s there? A gang of vigilantes armed with machine guns, leather straps and brass knuckles to thump the breath out of anybody who persists in playing this blame fool knock-knock game. Personally, I think that seems a little harsh. Okay, so after all these knock-knock jokes maybe you’re laughing, maybe you’re groaning, and maybe you’re pursing your lips and wondering why you even bothered to read this far in a post about something so stupid. Even those who consider that “puns are the highest form of literature” (Alfred Hitchcock) have to admit that some are pretty darn bad. But even those who deplore and despise the humble knock-knock joke should acknowledge that the best require creativity, mental flexibility, principles of rhetoric, and elements of poetry. Language is one of the things that makes humans unique, and one of the uniquely wonderful things we humans do with language is play with it. Without wordplay language would lose its joy. is about the most massively useful thing an interstellar hitchhiker can have. Partly it has great practical value. You can wrap it around you for warmth as you bound across the cold moons of Jaglan Beta; you can lie on it on the brilliant marble-sanded beaches of Santraginus V, inhaling the heady sea vapours; you can sleep under it beneath the stars which shine so redly on the desert world of Kakrafoon; use it to sail a miniraft down the slow heavy River Moth; wet it for use in hand-to-hand-combat; wrap it round your head to ward off noxious fumes or avoid the gaze of the Ravenous Bugblatter Beast of Traal (such a mind-bogglingly stupid animal, it assumes that if you can't see it, it can't see you — daft as a brush, but very very ravenous); you can wave your towel in emergencies as a distress signal, and of course dry yourself off with it if it still seems to be clean enough. More importantly, a towel has immense psychological value. 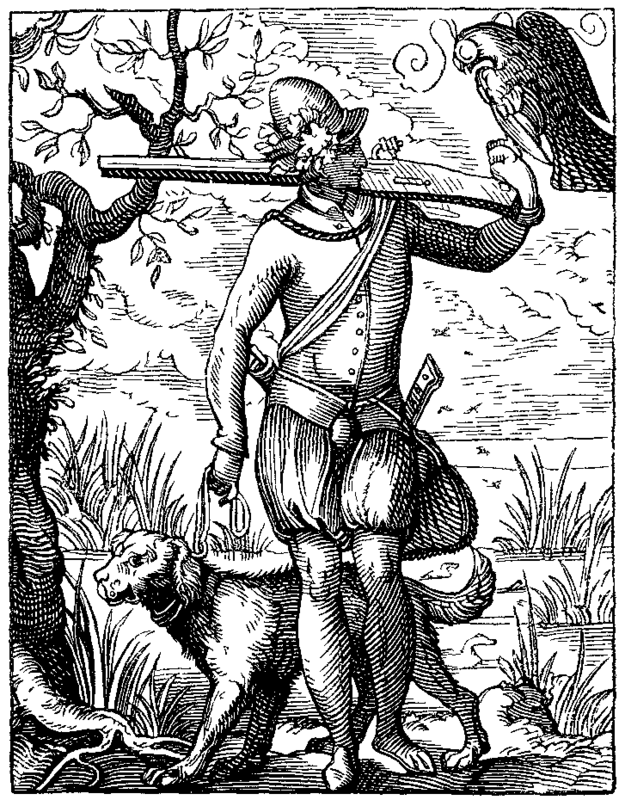 For some reason, if a strag (strag: non-hitch hiker) discovers that a hitchhiker has his towel with him, he will automatically assume that he is also in possession of a toothbrush, face flannel, soap, tin of biscuits, flask, compass, map, ball of string, gnat spray, wet weather gear, space suit etc., etc. Furthermore, the strag will then happily lend the hitch hiker any of these or a dozen other items that the hitch hiker might accidentally have "lost." What the strag will think is that any man who can hitch the length and breadth of the galaxy, rough it, slum it, struggle against terrible odds, win through, and still know where his towel is, is clearly a man to be reckoned with. Therefore, on Towel Day, fans of Douglas Adams and The Hitchhiker’s Trilogy are encouraged to carry their towel with them through the day. You can see a (somewhat slow) flash mob with towels in Dresden in 2014 here. Or, particularly cool for Towel Day 2015, check out this video to see astronaut Samantha Cristoforetti reading from The Hitchhiker’s Guide to the Galaxy IN SPACE (and on the International Space Station’s Expedition 42, no less)! 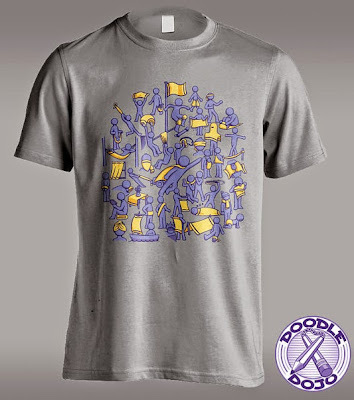 And it isn’t too late to celebrate Towel Day: this special towel design contest runs through June 7 on Bags of Love. 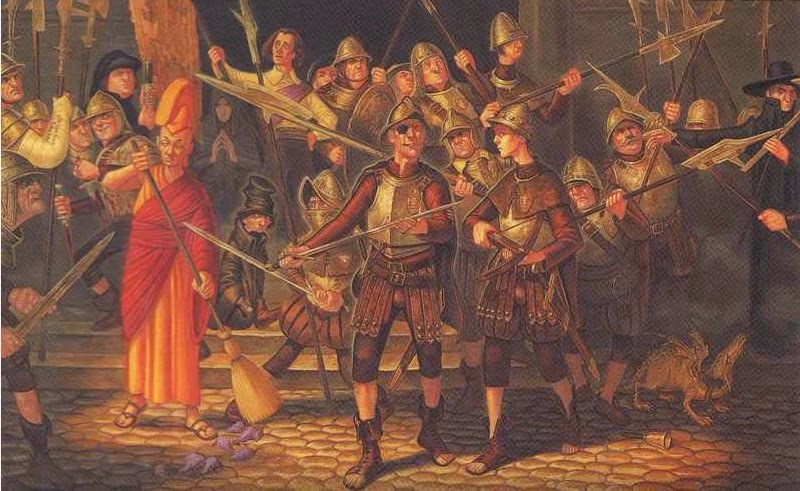 But as if Towel Day wasn’t enough, May 25 is also the anniversary of the glorious revolution led by the People’e Republic of Treacle Mine Road in Ankh-Morpork. 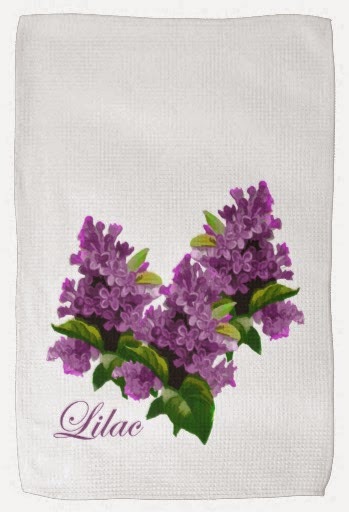 As described by Terry Pratchett in Night Watch (2002), the survivors of this uprising always wear a spray of lilacs on the anniversary (as well as visiting Small Gods’ Cemetery with the offering of a hard-boiled egg.) That’s on Discworld, of course. Here on the round Earth, fans of Terry Pratchett have called to commemorate the author on this date, as well as to use the wearing of the lilac to raise awareness and support for Alzheimer’s research. Today I printed the piece I began carving at my last show. 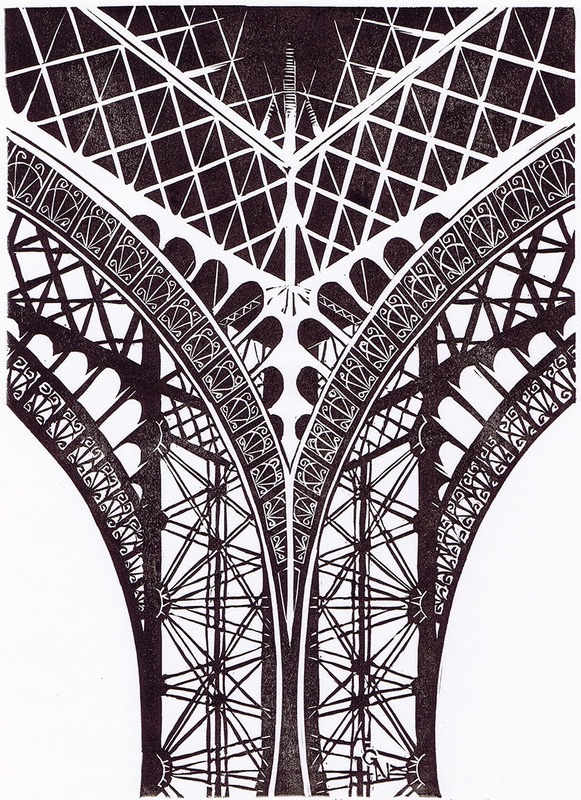 It’s based on a photograph I took on a trip to Paris fifteen years ago, standing under the Eiffel Tower and looking up along one of the legs. I liked the way it seemed almost abstract, yet still actually depicted something, and I liked the way there were areas of black on white and areas of white on black. way he’s obviously playing off of Hokusai’s Thirty-Six Views of Mt Fuji. 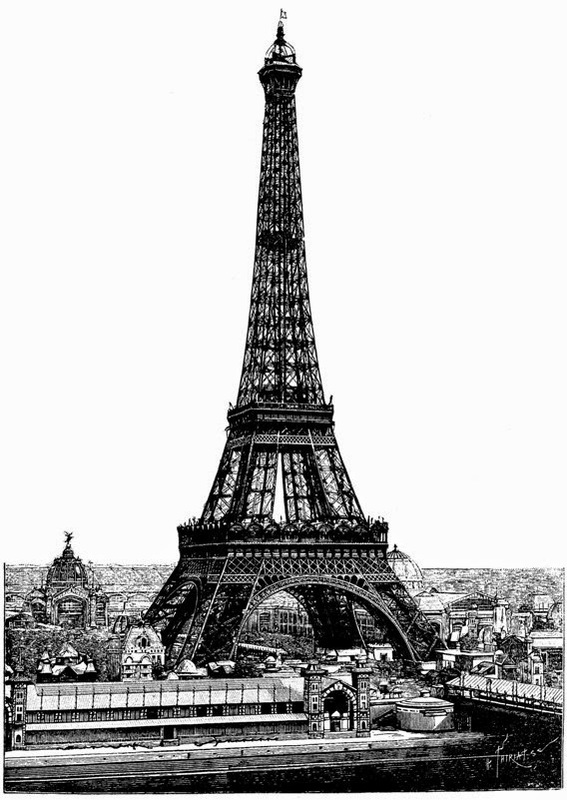 I also think it’s super cool that the Eiffel Tower is under construction in this piece. 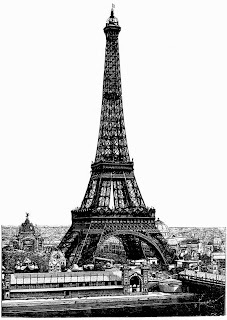 It took almost two years to build, but it’s hard to picture a Paris with half a tower looming on the skyline. I’ve also found a beautiful, detailed view from the year of the tower’s completion. This image was probably considered journalism more than art at the time, but I think it’s really quite lovely. It also puts my level of detail to shame! I worked so hard and long on all the little tiny lines on mine, and this anonymous artist has bested me by orders of magnitude! 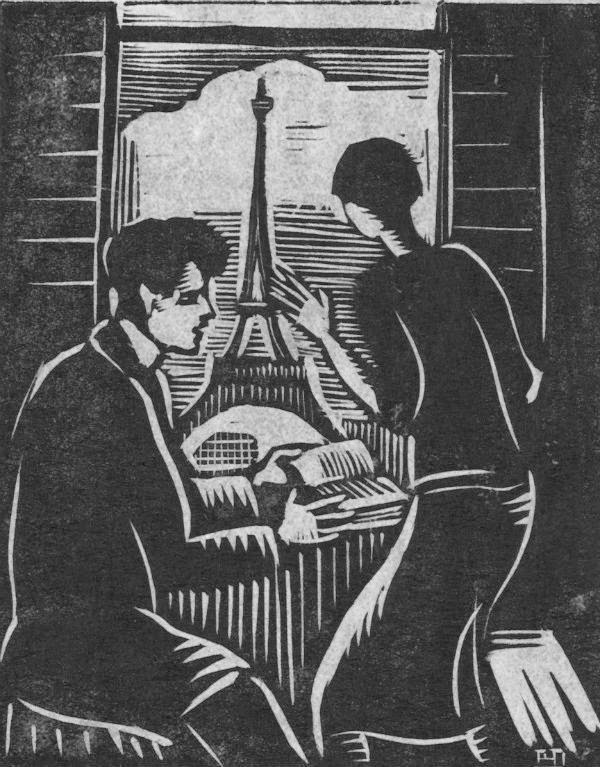 And lastly, an image of an artist beholding the glory of the tower - much simpler, no twiddly bits, but utterly unmistakeable. 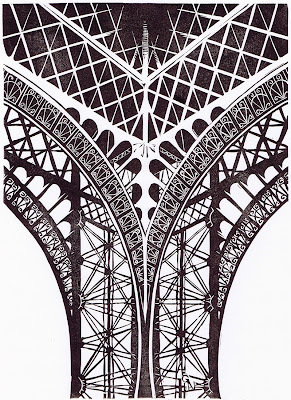 Indeed, the Eiffel Tower is so famous, so easily recognized, so ubiquitous an image, that I thought it would be fun to show it from an unusual, less recognizable view. It’s one of those dull rainy days here. Thank goodness, because we’ve been in desperate need of the rain, but nevertheless it’s making me feel sleepy and I just can’t seem to get any energy today. 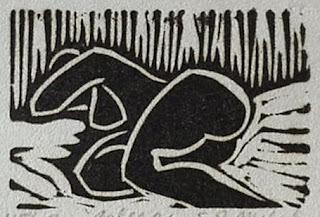 So I’ve chosen to go with it and feature some block prints that celebrate sleeping. Of course you have to understand that I wouldn’t be honoring the theme if I got all into deep reflection and in-depth analysis about these pieces. That would take energy. So I don’t intend to say much. Just sit back and enjoy the beautiful black and white. 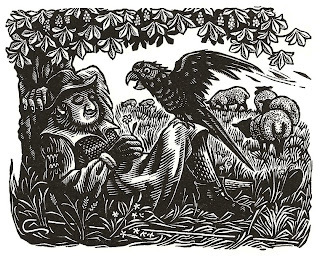 First, a woman asnooze with a couple of dogs, by Gwen Raverat. You can read my previous post on Raverat here. 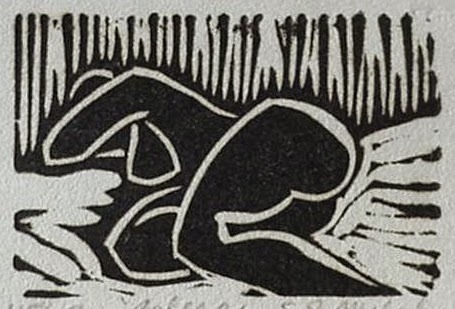 Since the woman’s hair is done and she’s wearing slippers, this seems the closest to how I feel right now: like lying down on the couch in the middle of the day and dozing. 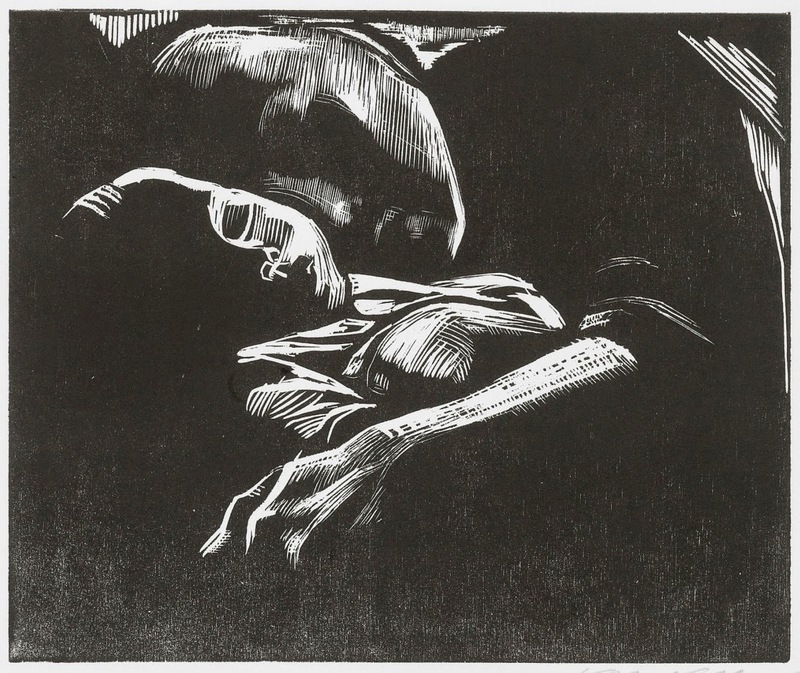 Next, a woman asleep with her child, by Käthe Kollwitz. You can read my previous post on Kollwitz here. When you have a baby, you grab whatever sleep you can get, so this woman is undoubtedly more genuinely exhausted than simply lethargic, like me. 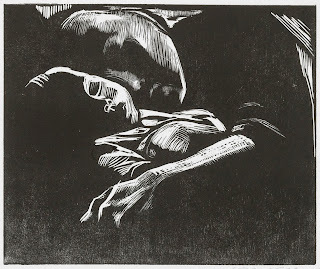 As always, Kollwitz does a beautiful job with the light and shadows. 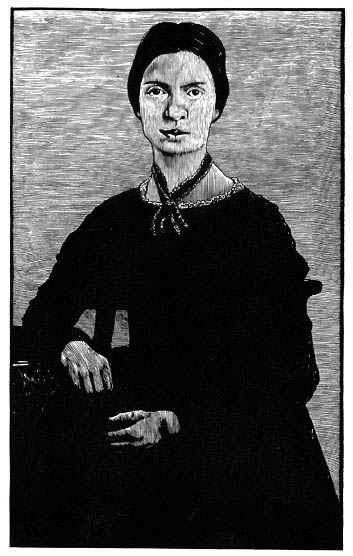 This next woman is about shape and line rather than light and shadow. But my main concern at the moment is not the Elements of Art but the art of the nap, and I don’t think this one looks nearly so comfortable with her body twisted and her arm thrown up over her face. Maybe the artist, S.J. Melcher, kept insisting on shining the light in her eyes while she was trying to sleep. shade. No rainy day for him. Possibly not much sleep for him, either, with the parrot squawking on his knee! And that’s enough for today. I wouldn’t want to overtire anybody. Anton Chekhov (Russia, 1860-1904) famously wrote, “If you say in the first chapter that there is a rifle hanging on the wall, in the second or third chapter it absolutely must go off. If it's not going to be fired, it shouldn't be hanging there.” He added in a variation of the same statement, “It’s wrong to make promises you don’t mean to keep.” This principle, encouraging Occam’s razor and discouraging false foreshadowing, is generally taken as advice to writers, which it was meant to be. But it also tells us something about ourselves as readers. That is, we expect everything that’s mentioned to have significance. Presumably this is because authors have trained us to expect significance. In the mystery genre especially we’re always looking for clues and we feel wonderfully clever when we think we’ve noticed the significance of the rifle on the wall. Of course, mystery writers want to keep us guessing. Therefore they sprinkle the room not only with a rifle on the wall, but a couple of knives in the drawer, a brass candlestick on the mantelpiece, a pistol in the desk, and some poisoned brandy on the sideboard. That way the rifle may never be fired after all. In a related effect, as readers we expect that any character given a name will be significant - or at least more significant than any nameless characters. Again, this is simply a convention employed by writers and learned by readers. In real life everyone has a name, of course, but a significant role in my life could easily be played by a person whose name I don’t know - and conversely, there are plenty of people to whom I’m introduced by name who then never enter my life’s story a second time. However, while readers may have been trained by our books to expect significance from anything specifically mentioned, there may also be some innate human characteristics that are reinforcing the habit. For one thing, we’re hardwired to look for patterns, so we want to make connections between everything that’s drawn to our attention. Researchers discovered that if a character in a story is introduced only by name, without any further information given at the point of introduction, readers keep that name in a specially accessible part of their memory until they learn sufficient background information to slot the character properly into the framework of the story. In other words, our brains are designed to use certain criteria to determine that some things are significant (such as proper names), and to treat significant things differently from all the other details in life that fly by (such as the people to whom we’re never introduced). 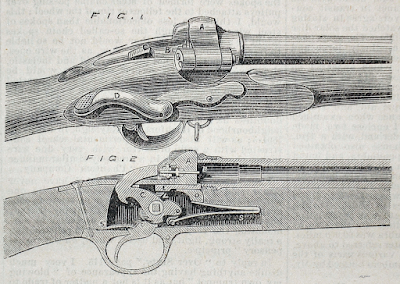 Now back to the rifle that was never fired because in fact the crime was committed with the fireplace poker. (Ha ha - fooled you, didn’t I? But I told you there was a mantelpiece, so you should have deduced the poker!) Chekhov is urging us to cut out all superfluities, and he’s quite right; everything in writing should be there for a reason. Just remember that the reason doesn’t necessarily have to be so obvious as Chekhov implies. I shouldn’t hang a rifle on the wall of my story for no reason at all, but that doesn’t mean it absolutely must go off. 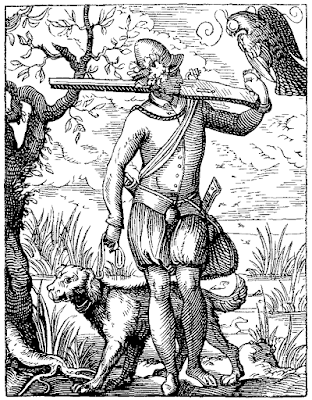 Perhaps the rifle is there to indicate that Major Grumbacher is a man who admires and celebrates the manly arts of hunting and war. Perhaps the rifle represents the memory of violent Grandfather Silas, whose oppressive influence hangs over the house like a shadow. 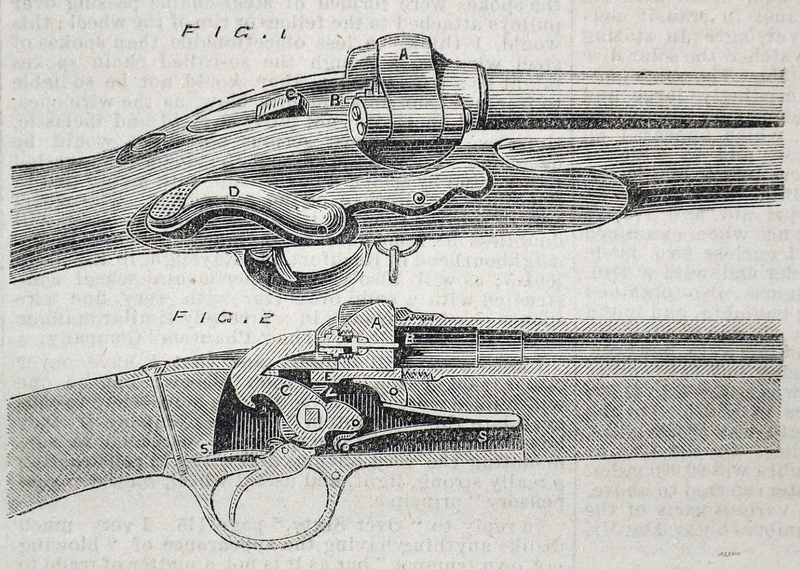 Perhaps the rifle is simply a red herring. Perhaps the rifle is a rare and valuable piece that once belonged to Annie Oakley and will be stolen by idealistic young Charlotte as an icon to represent the achievements of women. Perhaps taking the rifle off its display hooks reveals the lever that opens Lady Davenport’s secret wall safe behind it. Perhaps the rifle is a stage prop from Tony Terrence’s one great success 45 years ago… You get the idea. By all means cover your stories’ walls with rifles, but don’t be so boring as to make them all go off! To my delight, chickadees have been busy at my birdhouse again, and it looks like the robin’s nest in the hawthorn will be occupied once more. A catbird was seen entering the shrubbery with a load of fluff in its beak, and of course the dratted English sparrows are setting up house in all the gutters. 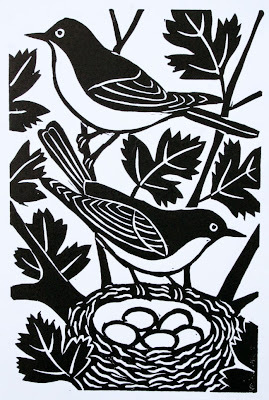 Yes, it’s nesting time here, and I’ll celebrate with a selection of relief block prints. 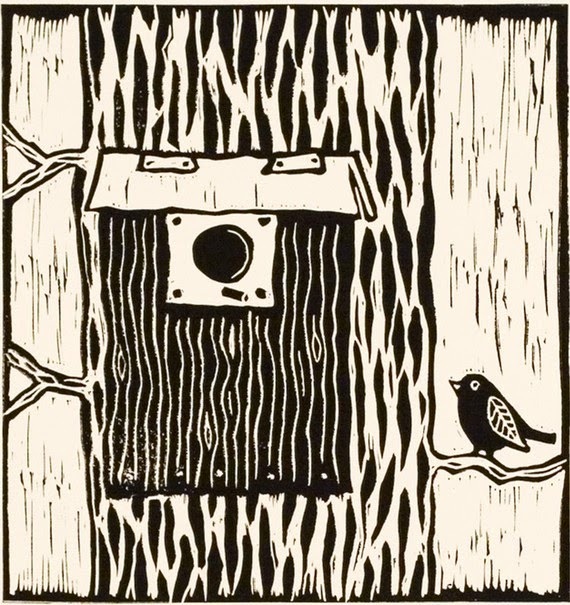 First up, a nesting box by Mariann Johansen-Ellis. We have one on a tree in the back yard. It was home for house wrens one year, but was unoccupied last year. The house favored by the chickadees hangs under the eaves of the front porch where I can watch them going in and out all day. 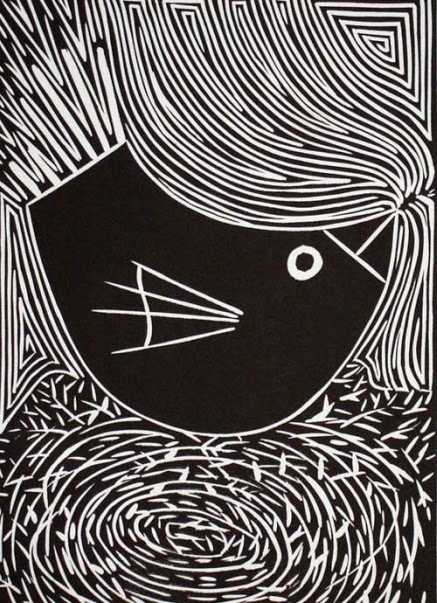 Next is a funny little bird on its tidily swirled nest. The lines that fill the background actually emanate from the tip of this bird’s beak, like sonic waves filling the air. Stylized as this bird is, with its geometry, the simplicity of its beak and sketched-in wing, and the exuberance of its tail like a volcano or a tassel, it has a solid energy. Sometimes these tiny feathered creatures do indeed seem to take over the airwaves disproportionately. 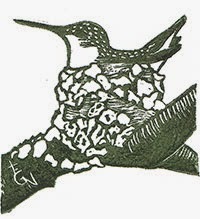 Here’s my hummingbird, the only nesting bird I’ve done (and with only one left before it’s sold out.) 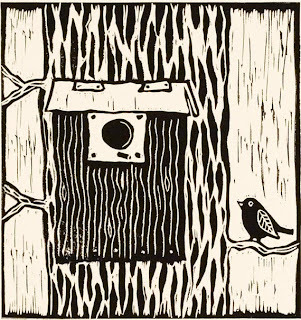 I’ve been toying recently with the idea of doing a portrait of my chickadees and their house, but so far it’s only images in my head and nothing has yet emerged onto paper. As for the hummingbird, she’s on the nest in this print mostly because I didn’t know how to capture the movement of hovering at the feeder! Also, though, I’m fascinated by the architecture and skill some birds display in their nests, and hummingbird nests are absolutely minute palaces with their precision craftsmanship and luxury materials. Finally, a pair of birds with their family-to-be in the nest. This comes from a series of linoleum block prints of the twelve months of the year by John Hinchcliffe. Naturally, this one represents May. I don’t know what particular species they are, but they remind me of American robins. The nest in our hawthorn is definitely not this tidy, though! And watched as his picture grew. A harebell nodded beside him. He dipt his brush in the dew. Because of the themes he chose. 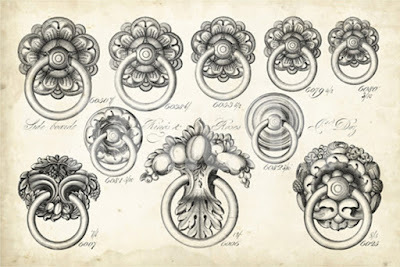 Could paint these marvellous things. I may be no elfin artist, and I may not have those exquisite brushes, but this is exactly what I hope to do in my art - to show the things that matter, the things that we all pass by. This is Children's Book Week, so I'll also mention two picture books with the theme of noticing the beauty around us. 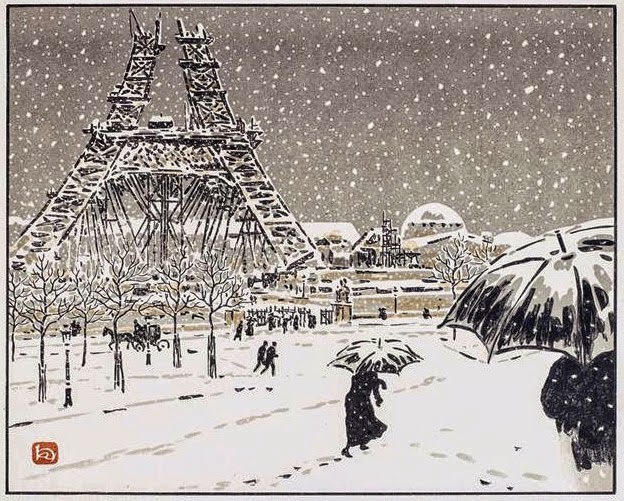 Neither has a fantasy setting, although both use a certain sense of fantasy in their illustrations in which the dull everyday as noticed (or, rather, unnoticed) by busy adults is in black and white and grey, while the touches appreciated by the children are infused with color. The Man with the Violin by Kathy Stinson and Dusan Petricic is about a boy who wants to stop and listen to the music played by a violinist in the subway. The music swirls through his day in waves of lovely color and even makes the boy float right off the ground in the illustrations. Sidewalk Flowers by JonArno Lawson and Sydney Smith is wordless and laid out in comic-book style panels. A girl takes a walk with her oblivious dad and picks the full-color weed flowers she notices growing in the city. The lovely thing about this book is that as long as she’s simply noticing and collecting things for herself, there are only individual tiny touches of color, but when she starts giving her flowers away, the color begins to spread into the whole pictures. It doesn’t matter whether or not the recipients are responsive; it’s the act of giving that does the trick. Never mind that all the adults in these books are such bad role models and it’s only the children who are free-spirited and heart-whole enough to notice and appreciate the beauty around them. I identify myself with the children, and with the elfin artist, and I hope that every once in a while my art might help an oblivious human adult become a little more full of wonder — thus, in the visual vocabulary of the poem and books, infusing the world with color even though my art is black and white! Today I finished the block I worked on at my open studio show this past weekend. I didn’t know what people would make of the design as they watched me carve, and I must confess I was rather surprised by the positive response. I think only two people used the word “steampunk,” so this probably isn’t the population that’s a natural target audience for Nycteris & Flederer’s Patent Mechanical Chiropterid (Model 3). 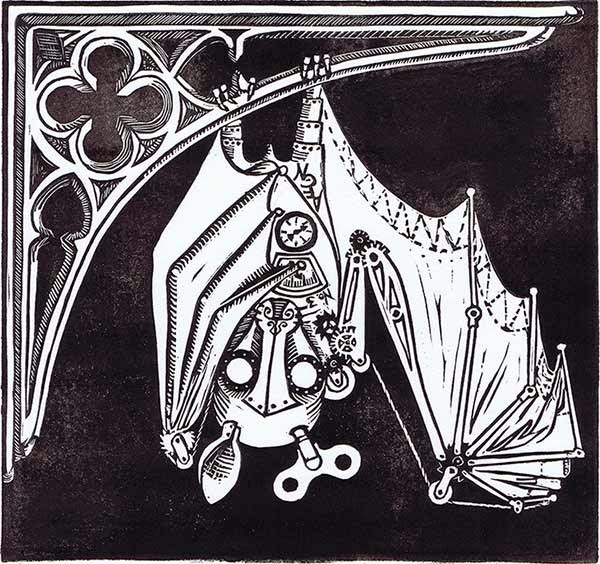 Nevertheless I had an unexpected number of fun conversations about the charms of robot bats. It’s my son P who’s been encouraging my predilection for steampunk animals. (He’s been advocating for a clockwork pelican, which may come in time, although I actually want to do a real pelican, too.) I thought a bat would be cool because I was picturing how a mad scientist-type might build such a thing, and I originally envisioned it with kitchen funnels for ears. But I couldn’t make them look good despite several attempts. I think I redid the ears more than anything else on my sketch before settling on placing the wind-up key atop the head (or, since it’s a bat, below the head, I guess.) Because I’m not really an engineer designing a real functional device, I admit I’m a little vague on the actual workings of this critter. The wind-up key implies clockwork, while the dials imply steam power. I make no claims that the gears shown would produce successful powered flight. What I was aiming for was a basic level of plausibility, topped off with a dollop of all the fun stuff. As for the carving, I wanted this bat to be hanging in the dark, with enough shadows that its eyes would look like lit lightbulbs. I’m not sure I quite succeeded in that - I just can’t seem to help myself from carving out plenty of white instead of leaving dark and shadowy texture. But I’m happy with it anyway. After all, I never intended it to be spooky or sinister. I wanted a friendly robot bat, and I think I got one. And now I need to come up with another idea for another block, because my next chance to sit carving for a weekend comes up in just two weeks at Dedham Open Studios. Hmmm… So many wonderful possibilities! which the kids at P and T’s school had decorated the papers, and I look forward to hearing them read out the words of their poems this morning. It is in the children’s poetry that I find hope for our future. what they carve (unless you want to!) so there’s even more surprise, and even more delight when you see the beautiful, intricate designs you can get by inking, stamping, and combining multiples of your own small block. 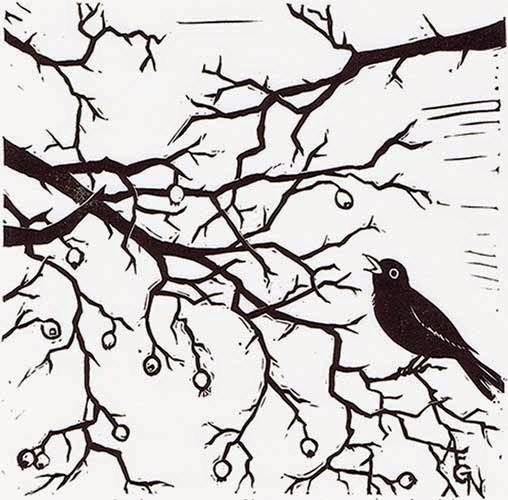 Come join me during Needham Open Studios to see my process of making a large relief block print, and then try your hand at carving and stamping your own miniature block.